Hotel Mumbai is one of those films that will stay with you long after you leave the theater. It’s the type of skillfully made thriller that only comes around once in a while. Don’t miss it. I have always found films about India to be fascinating. Probably because India is a place of mystery, magic, philosophy, and hidden secrets. A place so big and filled with so many people that you get the feeling that anything could happen at any moment; and it did in the most terrifying way in 2008. That's when the members of the "Lashkar-e-Taiba" terrorist group laid siege to the "5 Star Taj Mahal Palace Hotel" in Mumbai. This is not your typical terrorist film in any way. It's a gripping and vivid film recreation of the events that occurred in the Hotel. The dramatic story about the victims and survivors of the attack, how they protected themselves and how they dealt with impending death at the hands of ruthless trained killers. The dramatic acting in the film is blended so seamlessly with actual footage it seems to transport you right into the center of the action and make you identify with the characters themselves. Their experience becomes your experience, and it makes for a very unique film event, one that is both harrowing and entertaining at the same time. This gripping true story tells the dramatic tale of pure heroism by the dedicated staff of the Taj Mahal Hotel. The Hotel's renowned chef Hemant Oberoi (Anupam Kher, "New Amsterdam"), and a waiter (Academy Award-Nominee Dev Patel, "Slumdog Millionaire") are the two main staff leaders who amid chaos, gunfire, and mayhem, risked their lives to protect and save the guests under their care. With the country's only "Special Taskforce" eight hours away in New Delhi, and the small poorly trained police contingent on hand ordered to stand down and wait for help, the terrorists are free to execute their plan of going from room to room in the massive hotel and kill or take hostage anyone they find. As the world watches, some guests make desperate attempts to get out or protect their families, like new parents (Armie Hammer, "Call Me By Your Name" and Nazanin Boniadi, "Homeland") who are forced to make unthinkable sacrifices to protect their newborn child. Here in his edge-of-your-seat feature debut, Australian director Anthony Maras, succeeds in creating a non-stop series of emotionally shattering suspenseful action sequences in which dread and violence seem to never end, while also managing to deliver a salient message on how class differences are put aside during a time of intense mutual struggle. The acting is first rate as well. Patel is once again at the top of his game and wonderful to watch, as is Boniadi as the new mother struggling to get to her child. My take… This is one of those films that will stay with you long after you leave the theater. It's the type of skillfully made thriller that only comes around once in a while. Don't miss it. "Hotel Mumbai" is Rated R for disturbing violence throughout, bloody images, and language. Download Hotel Mumbai from the iTunes Store in Digial HD. 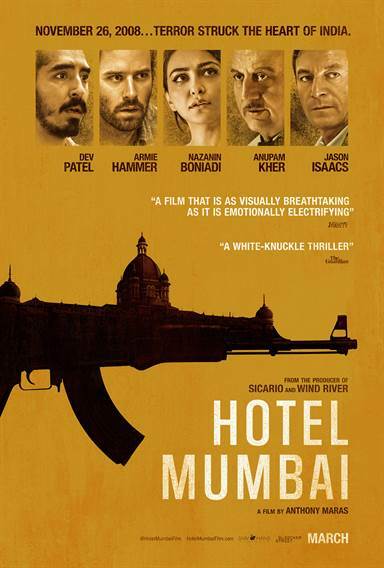 For more information about Hotel Mumbai visit the FlickDirect Movie Database. Alyn's acclaimed book, entitled "The Script…A Breakthrough Guide to Scriptwriting", has sold over 16,500 copies nationwide, is currently being translated into several languages, and has the honor of being included in The Library of France in Paris. He has written and sold five original film scripts and been published in Newspapers and National Magazines. In addition, he is a frequent guest lecturer at Film Festivals, Colleges, and Universities, holds scriptwriting and acting seminars for professionals several times a year, and has been a staff professor at both the Miami Film School, and the Florida Film Institute. Read more reviews and content by Alyn Darnay.